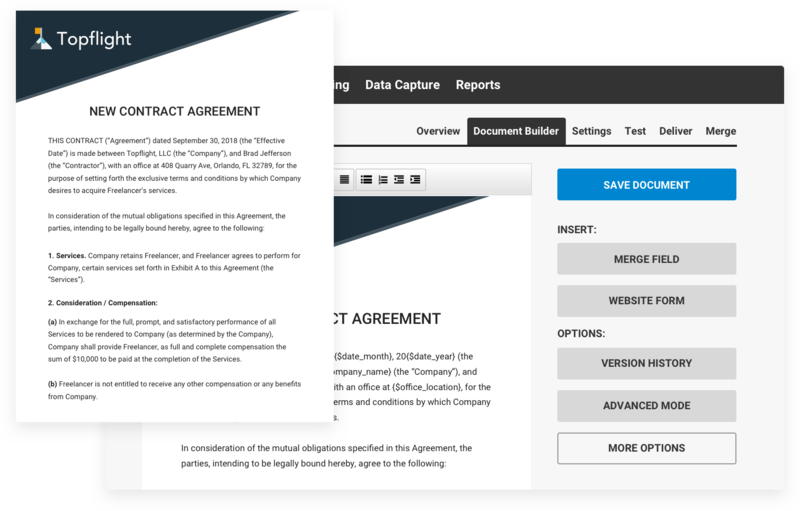 Cut document preparation time and streamline inefficient, manual processes with automated WebMerge contracts. Contract creation is a costly and time-consuming process often requiring specialized staff to draw up papers by manually replacing names and terms throughout a generic template. WebMerge replaces manual business processes by helping you generate sophisticated documents using only the information needed for that specific contract. Using our Conditional Sections, you can define areas in your document that are to be included if a specific condition is met. Use it for wills, employment contracts, real estate documents, and more. Improve the contract generation process. Integrate with your favorite products. Optimize your contract creation and delivery with Podio, Salesforce, Infusionsoft, Oracle, Zoho, Velocify, and more. Keep your team on the same page by generating documents that can be easily sent back and forth and saved locally. Select the best plan for your organization such as a low-cost micro plan if you’re generating less than 30 docs/month. Use if/then conditions, automated calculations, and more to customize your documents. Automate your contract generation process from creation to delivery. Keep your team organized and on track by using Podio to generate dynamic contracts. Send your files to apps like Adobe Sign to quickly collect eSignatures from clients, customers, and partners. Start creating contracts faster and more efficiently with WebMerge by starting a free trial today.